Shape Up and Tone Every Inch! Achieving your best body ever takes sacrifice and determination. But it also requires the right workouts, exercises and diet to get you there. In the October issue of FitnessRx, we provide all the tools you need to get sculpted, strong and tight! In order to lose fat and achieve a six-pack, you need an effective fat-burning, healthy diet that you’ll actually stick with, as well as an intense training program to really set you on the right track for success. In “Flat Abs Belly Burn Workout and Diet with IFBB Pro Justine Munro” by Lisa Steuer, check out the ultimate program to help you burn belly fat fast. Our cover model demonstrates an effective flat abs workout that engages all aspects of the core for optimal results. Plus, our Flat Abs Belly Burn Diet includes delicious, healthy and easy recipes and a two-week meal plan to really help you burn fat and get healthy. We are so excited for you to try out this detailed program— when you try it, let us know how it’s working for you! You may think that the Smith machine is just for squats and presses, but it’s actually a very versatile machine that can benefit your entire body. In “Become A Glute-Smith: Shape Up With One Versatile Machine” with IFBB Bikini champion Ashley Kaltwasser by Jaime Baird, we show you how to sculpt a killer lower body using just one piece of equipment. This is perfect for when you are short on time, or if you just want to change things up. In addition, because of its fixed up and down movement, the Smith machine offers several benefits to help us reach our training goals, including stability, form adjustments and more. Everyone wants flat and sculpted abs. But while you are working toward that goal, why not build your arms and shoulders, too? 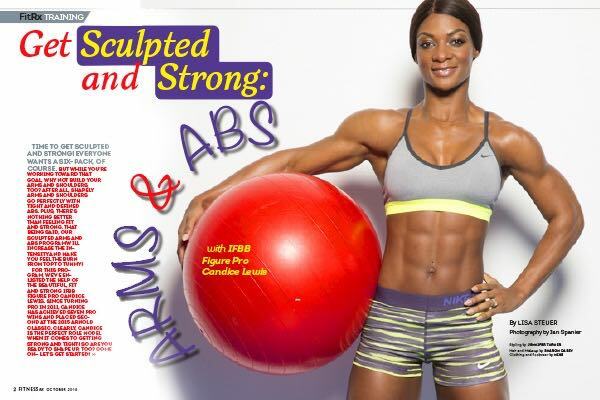 In “Get Sculpted and Strong: Arms and Abs with IFBB Figure Pro Candice Lewis” by Lisa Steuer, get ready to increase the intensity with Candice’s abs and arms/shoulders workouts. As a fit and strong IFBB Figure Pro, Candice is the perfect role model when it comes to getting strong and tight. You can do these workouts on the same day a few times a week or on separate days if you want to change things up. Either way, get ready to get sculpted and strong! In terms of training priority, the back often gets the shaft. But when you have strong and conditioned trunk muscles, it makes for a balanced and healthy body. Plus, a great v-taper makes your waist appear smaller. In “Back to Back with Four-time IFBB Figure Olympia Champion Nicole Wilkins,” by Jaime Baird, take a look at how the champ trains. Nicole is seeking her fifth Olympia title and continues to make improvements— which is clear, because she has one of the best backs in the business. So if you want to improve your back, try out the program and get ready to see results. This year, the U.S. women’s national soccer team made headlines when they won the World Cup. For soccer star Christen Press, it was a dream come true to be part of the team and she even scored a goal in a game against Australia. In “Yoga Trends,” Christen chatted with us about how yoga and meditation have improved not only her performance, but also her well-being and mental health. As usual, the rest of the issue is packed with the most cutting-edge tips, workouts and advice from the experts as well as scientifically backed research on exercise, healthy eating and achieving your best body ever. Get ready to tone up, incinerate fat and shape up now— pick up your copy of the October issue today! Order a digital copy by clicking HERE!